It all starts when four siblings of the house of Xaniqos receive an urgent message to return home immediately. They leave their various academies – scout Phaedra, wizard Jharrath, fighter Alvra and cleric Lilith – and hurry towards their new home in Erelhei-Cinlu. 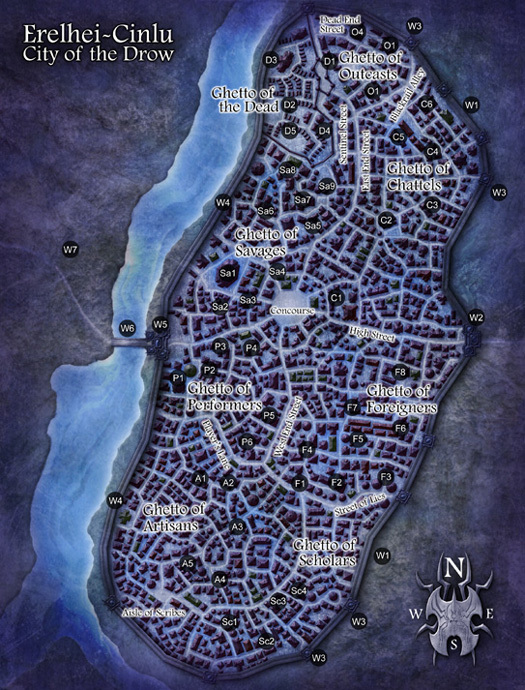 Like all drow cities, Erelhei-Cinlu is situated underground and is built on an island. Only one bridge leads from the city into the Underdark. There is a wall all around it and in the west another bridge leads to the Noble Estates. This area is backed up by a huge cliff. In the early morning the four are supposed to report to the Matron Mother in the hall near the altar of Lolth. Jharrath hurries down the stairs, a drow of average height with a smooth stoic face and straight shoulder long hair. Dressed in a gray robe with long sleeves, boots and some simple jewelry, he walks towards the central room. His eldest brother Alvra follows on his heels, a long and muscled lean drow, sturdy and – like his brother – stoic, even a bit surly, dressed in a chain shirt and a piwafwi. His eyes are bright red. Downstairs the rest of the family is already gathered. A petite female with silver hair and amber eyes is among them: their sister Phaedra, third daughter of the House of Xaniqos. In her short dress, high boots and gloves she looks quite beautiful. She is wearing a spider on a choker around her neck. Next to her is their other sister and second daughter, Lilith. Slim yet wiry, with a pure black skin and lavender almond-shaped eyes, she is dressed in tight-fitting black long skirts with high splits and a leather bustier with red silk accents and a family brooch. She wears a leather band around her neck and and holds her long white hair back with hairpins, so it tumbles down her back in a nonchalant mass. Their mother Thandysha is waiting impatiently, flanked by her eldest daughter Quarra, a very tall and heavily muscled imposing drow female. Very arrogant too. Next to her are Taldinyon – weapon master – and the house wizard K’yorl. Above a basin of water, there is a beautiful statue of Spider Queen Lolth. When Lilith looks at it, she sees the image waver between the ageless beauty of Lolth and the horror of a drider. The cleric doesn’t have much time to wonder over this phenomenon, since the Matron Mother Thandysha speaks up. House Xaniqos is moving up after the ‘acquisition’ of house Everhate with all remaining assets. I need every hand – even worthless ones like yours – to strengthen our new position as eighth House of Erelhei-Cinlu and take Xaniqos to a higher level. We are lacking slaves and have problems at the rothé island. Furthermore we lost the Weapon Maker during the takeover. Go into the city and pick up the weapons we already paid for! The two female and two male drow bow their heads and rush out the hall to do her bidding immediately. It is not healthy to make a Matron Mother wait.